PANHANDLE BRITISH CAR ASSOCIATION, INC. Your Loyal Correspondent (YLC) has just returned from a visit to the Versailles Palace of garages, that of PBCA member Bob Manske. This phantasmagoria of garages was built by contractors working under the direction of Bob, with it envisioned in 2012, construction starting shortly after, and completed in 2014. Shaped in the form of a fat “L,” it measures 50’ x 30’ at the body of the L and juts out for another 42’ at the bend of the L, encompassing some 2700 square feet, some 1800 of which is climate controlled. This imposing structure houses an inside lift capable, it seems, of hoisting a school bus, and a wash station outside in front. His other appliances are also placed inside, with all tools snuggly fitted in wall cases, benches, and tool chests. Its overall appearance is reminiscent of a wellregulated dentist office, with even gleaming sealed floors. Truly a wonder! For all Bob’s faults (see index for a complete listing), selfishness is not one of them. Generous to a fault, he contributes his time, and often his money, to PBCA to an extraordinary degree. He and Risa are welcoming in their home, and Bob is welcoming in his workshop. PBCA members and friends have visited the edifice over 60 times, used his tools and often his supplies and his splendiferous lift (according to the neatly recorded log of names, dates, and repairs made), with TR expert/PBCA member Franz Bachman being the first (revelation: early on, YLC parked his sparkling TR6 on that selfsame lift for over a week, denying anyone else access), without major accident or incident. 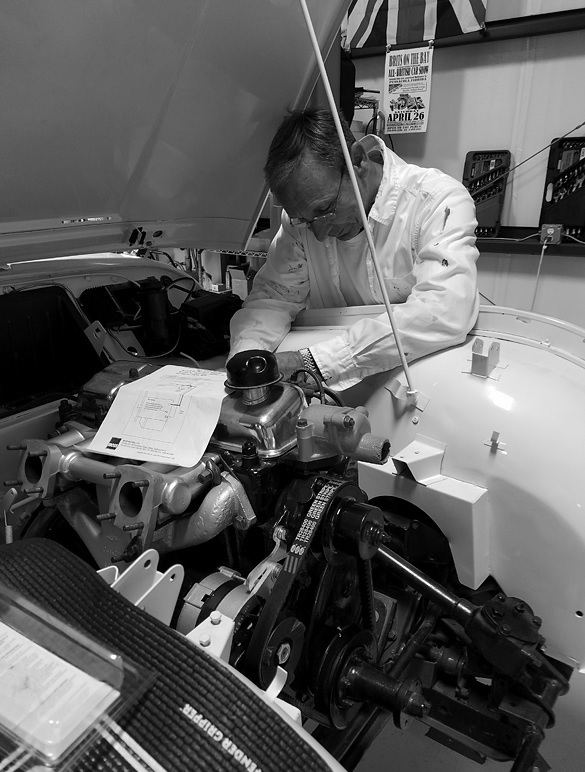 Bob houses his 1955 MG TF 1500 and his 2012 Jaguar XKR, plus his Triumph Bonneville T-100 motorcycle, in the garage, but his personal project is the restoration of his 1960 TR3A, a car that showed little promise when first purchased until Bob spent the last three years on it, devoting meticulous effort on the car, under the guidance of wizard Franz. 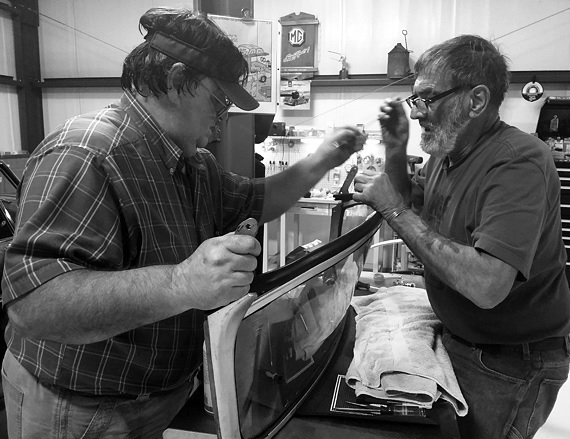 Admitting early on to knowing little about auto restoration, Bob has earned a graduate degree in doing it over and over again until you get it right. Pictures show the TR coming to near completion, and a handsome vehicle it is. When queried about the toughest task he faced, he surprisingly said not the engine or electrical, but “the repair of the fresh air vent, operated by a push-pull mounted on the dash. Repairs had to be made under the dash while upside down on my back and in tight quarters.” Some uncivil language blistered the air at times, no doubt. Whether drinking a Yuengling brought by visitors or in some cases furnished by Bob (under the neon Yuengling’s sign), the workshop is a congenial place to gather for conversation, comradeship, and congeniality, and a welcome spot to escape the hurly-burly of our world. Thank you, Bob. Summer is a time when events slow somewhat, but PBCA has kept the spirit alive. July 11 — Breakfast at the Grand, followed by the Executive Board’s planning for future activities. It began at 10 a.m.
July 17 — PBCA monthly meeting at 6 p.m. Business, information, program, 50-50 and door prizes. This time it was held at the Horizon Buffet in Gulf Breeze, with details via e-mail. July 28 — Fancy Friday on the Town, 6 p.m. at Rodizo Grill, a Brazilian-themed restaurant at 606 E. Gregory St., Pensacola, with details via e-mail. July 23 — The premier event of the social season, the Annual Pig Roast at the Schmitz house, 12 noon. All are invited to bring a dessert or side dish, with the guest of honor arriving about 2 p.m. Thanks to the Schmitzes again. Directions and details were provided via e-mail. August 1 — Breakfast at the Grand, 10 a.m. Nothing but good food and conversation. Always a popular event, followed by the first meeting of the Show Committee’s work on the 2018 Brits on the Bay Show. August 12 — Planning goes forward for a driving tour to the Marianna Caverns, if possible. Details to follow via e-mail. August 16 — Executive Board meeting at the Grand at 12 noon, to continue planning the activities of the club. August 21 — PBCA monthly meeting at Sonny’s on Navy Boulevard at 7 p.m., dinner at 6 p.m. Business, information, program, door prizes, and 50-50. Until next time, don’t try again to brew your own fuel. That mushroom cloud scared everyone. 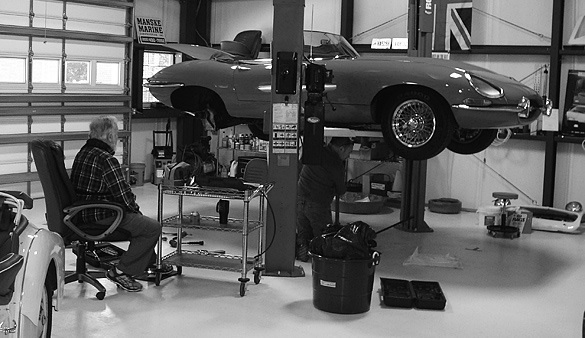 Marc Cherry works on his E-type while Gus Fell advises. Bob (right) soldiers on with help from one of the wizards. Bob continues alone. Is there a risk to this? Wizards Tom Matsoukas (left) and Franz Bachman, doing all the hard work.